After adding an option to edit locations, Google Maps allows people to add places. The option seems to work only for the US and you can enter few details about the local business or the place: address, name, phone, website and category. Google promises that "once you save your place, the whole world can find your addition by searching for it within a few minutes." 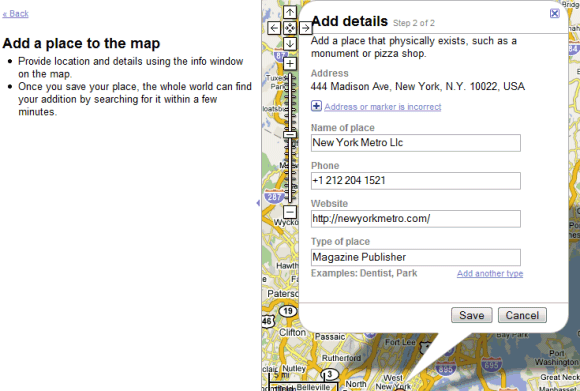 To find this feature, go to Google Maps, search for an address (e.g. 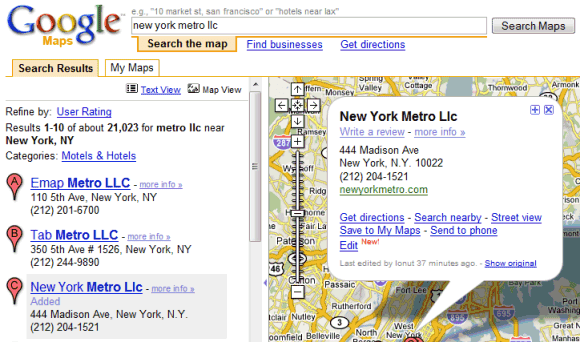 : Madison Ave, NY) and you'll see a new option in the left sidebar: "Can't find what you're looking for? Add a place to the map." You can also edit the details from existing listings and even remove places from the map. Among the possible reasons why you could delete a place you can find: the listing is a duplicate, the place doesn't exist, it is permanently closed or it's not of general interest. While business listings are changed almost instantly after you edit them, they can be removed only if someone from Google accepts your removal request. Each local listing can have a status like "Added", "Edited", "Removal requested" and the changes history is available to everyone. Until now, only business owners could add places, using Google's Local Business Center. "We gather business information from numerous websites, Yellow Pages directories, and other sources to populate Google Maps search results. If you'd like to be included, you can easily enter your information into our online Local Business Center for free. (...) Once you've submitted your business information, you'll need to verify the listing before it goes live. You can verify using a touch-tone phone, SMS, or a PIN that will be sent via regular mail to your business address. Once the listing is verified, your information will normally appear in our results within six weeks," explains Google. It's great to trust your users, but the places added using the new feature should be verified to make sure they are real. Turning Google Maps has a lot of practical advantages and could be used to keep the geographical information up-to-date. Update: Google says you can edit places from the US, Australia and New Zealand. 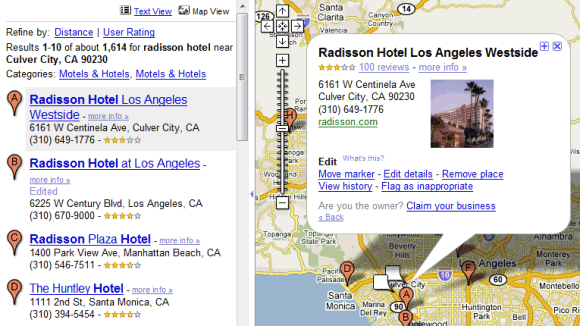 How Google Maps will solve the problems of spam and misinformation ? Thats's just what I am asking myself. Google has to have tons of employees only for the deletion of the SPAM. If these employees just would make it themselves. @JN : It doesn't seem available in France, I can't find what Ionut is writing about. Where do you see that? Even with &gl=us parameter it is not displayed. "How Google Maps will solve the problems of spam and misinformation?" Tom> I had the same function in Google Maps in french but it's not possible to register a company: "We do not support adding a place here yet"
Tom, you are right ! Allowing anyone to edit Google Maps info is just an invitation for spam. Already the Google Local Search Results review section is littered with friends/ competitors registering a single-post Google account just for the sole purpose of bumping/ sabotaging a business. fool, I can't edit the wrong STATION mark in rome - try to search "stazione, roma Italy" and you get the FIAT building in viale manzoni. I tryied to edit it, but I can't (no option to edit nor to move) then to point the error to NAVTEQ and TeleAtlas as said here http://maps.google.com/support/bin/answer.py?answer=98014. no way (neither on NAVTEQ or TeleAtlas I can reproduce the error) - mah, I can't really rely on Google Maps if it can't find a main city train station. well, my country is not in the selection list! what do i do? just more information, BUT again NO ANSWERS. Making any changes seems impossible to me. I've had a similar problem. Company moved. Old address still appears. Corrections have been made several times over in Business center - over 4 months ago. NO UPDATES have been made by Google. How can i delete worng address marked on google map and I am not the owner of worng marked one. The best way to get an address corrected for a business is to contact that business and let them know. Most businesses are "owner verified by google". You can let google maps know there is a problem with the address, but I have found that if you quickly email the business owner and tell them about the wrong location, they will generally update it. Obviously they don't want everyone updating the maps that are not owners of the address. If you can explain why the marker is in the wrong spot (e.g. a marker appears in a completely wrong town than the street address) and that it is kind of important that wrong listings in google are cleaned up. Make sure you clear your cache and browser periodically when working on google maps. I am not able to add a place for Panama City Panama, even worst, It seems someone's directory site was crawled and that included another business with link to my site, some people listed as "panama tourism bureau" have our website as their url and this is incorrect. I find a wrong listing of my bussiness marked "A" in google maps results. The address is wrong, all the information is about the actual place, wich, by the way, I claimed and control since long ago and appears as the "B" place. But I can't correct/delete/claim/flag the wrong one in any way. I find info about Edit option, but I get no such option in LBC results. The explanations in "What if I already see my listing in Google Maps?" look very easy and simple... If only I could find the "Edit" option for the wrong one. I want it out of google results ASAP as it is damaging our business, driving our customers to the outskirts of the city. This is crazy but the consequences are serious to me because, as the webmaster, I feel responsible for this before my bosses, but I can't do anything. Furthermore, having spent hours googling about this, browsing LBC help pages... I find particularly annoying the fact that there is no way to get in touch with the people behind LBC, the wrong listing is still there and I am losing my patience. I live in Turkey, but it says "your country is not supported yet" I want to add a place, but it is impossible. The weird thing is, there are already many places added before. It does not works for some places near Sibsagar, Assam. I would love to move the little "A" mark to where my house ACTUALLY is, since Google Maps places the address about 2 miles southwest of where it ACTUALLY is. It's a little ridiculous that I can't correct it, since .. well.. telling someone "okay, look up the address" just won't fly.. since my home is in a rural area, they go too far and they get lost in the woods somewhere. Bad enough my road is not paved, but to have someone lost on a deer track because Google Maps tells them to go almost three miles further than they should go? That's unacceptable. My old residence was an apartment building... and according to the mark on the map, I lived in the middle of a parking lot across the street and down a block. There has to be some way to correct these little pinpoints so they stop confusing other people. Bad enough that residences are wrong - but what if you're traveling to a new city and you THINK a place is in walking distance from your hotel only to find that it's really about three miles away? is the option available in India? I added our business name in the google maps, however it has not been reflected in the google maps. Could you please let us know how long will it take to reflect the changes in the google maps. Every time I try to delete "My Places" from Google, it crashes... What? I like add place in Kathamndu. Is there any way that I can add my coffee shop in google local (within Kathmandu, Nepal)? How much time its takes to the data to change ? I am having a similar problem (for Sydney). I want to direct people to the St Mary's Cathedral forecourt as I am helping to advertise an event there. The cathedral is on the map, but the marker is about a block from where I want people to actually go. Aside from using a geocode to place a marker on my map, is there any way to suggest a new place (specifically when it is a public place). Well, it's updated version for Business (Google Places) is very interesting. While adding New Location it return Error. ow Google Maps will solve the problems of spam and misinformation ? I couldn't add a place in Costa Rica. Any word on when that might happen? There are no specific addresses or street signs here, so it would be HUGELY beneficial for local businesses and people trying to find ANYTHING in the area. Please add the 'edit/add' for Canadians! My 2-year old address STILL does not exist in Google maps, nor anywhere else, apparently, as NOBODY can find it. It's a ridiculous series of instructions I have to give EVERY time I order anything for delivery, or a taxi, etc....the planners were obvious idiots on this project. can i edit a place name in goggle earth if can, then people can view my edited place from the whole world? pls tell me the easiest way to edit the plce name .i am the from bangladesh. 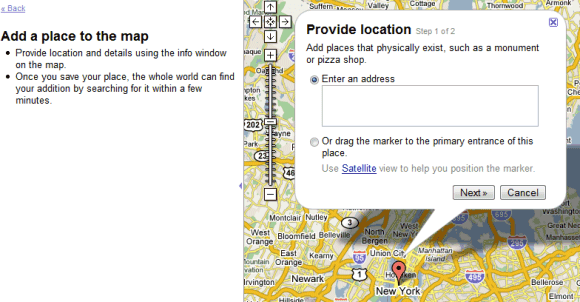 This option is no longer available, even in the U.S., where the only way to add add something is through Google Places. My business used to appear on the local goggle local maps and now doesn't. I have asked others for help but have not found the solution. I've been trying to add my business FLB Bar in Pattaya, Thailand for over a year. I finally got a Needs Verification status in Oct 2011, and requested a PIN code via mail. It finally arrived in Dec 2011. I entered the code, and now the business has gone back to "Pending-Under Review". That's where it was before it went to Needs Verification status. Am I going backward or forward? I am trying to change the directions to my business on Google Maps and can not find out how to do so. Google Maps directs people to enter at an incorrect street. How do I change this? I tried editing the placement of the pin and then got the Needs Verification status. It says the pin will be mailed in three weeeks. Is there any other way to change directinos quicker? I can see other businesses having their name with place mark in the street. I'm having place mark at the right place but there is no name on the street. How should I mention my business name? Any help would be appreciated. I think its not available in india. I am still searching how to add. Let me know if u find any. no , this facility is not available in India. No alternate option too. I want add my village name on google map.My Village name is Chikhali(Nath) near by Gahininathghad MH,INDIA. I want to add my village name on google map. My village name is lukhi(rajputan) near by kurukshetra Haryana ,INDIA. This solution suggested by google is not useful to Indian residents as we do not get a 'add a location' option. I wish to add my work place on the map. I am based at Mumbai. My office location is S P Jain School of Global Management, Munshi Nagar, Dadabhai Road, Bhawans Campus, Andheri West, Mumbai - 400 058. Can someone please add this location to google maps??? How many day are required to accept our proposal to add places to google maps? I have lost my googlemap id and password, now i need to remove a listing on that account, can any one help me out in this regard. We had the same problem in Google Places and we have resolved it. In Mongolia, there is a lot of places are misplaced. But how to resolve Google? On the assumption of misplaced places, many tourists lost. In Mongolia, many places are misplaced on Googlemap. Some of them made illiteracy, and some of them missed a building. How to resolve this problems? On the assumption of misplaced place, many tourists lost in Ulaanbaatar, and don't know how to ask Mongolians. Its taking time to adding place in google map but its working ....! It would be nice to delete multiple places at one time or and entire group; say: right click "Places Earlier This Year"> Delete all. There could be other option in that link as well... Mark all as favorites, share all, etc. (not a program writer by any means). Another option would be to have a manage my places where multiple boxes could be selected for editing similar to gmail format. I'm having the exact same problem. My business has an incorrect listing location, and I cannot report / remove it at all (the options are just greyed out). What can I do? It shows up as the first result in a Google Search! Can I Enter, edit or delete a location from pakistan.